When Volkswagen was thinking of launching the Tiguan SUV in India, it not only wanted to capitalise on the SUV trend in India, but also make its presence felt. Well, the response to the Tiguan has certainly given Volkswagen India the much needed push to bring more SUVs into India. The folks at VW India have told us that the Tiguan SUV has been sold out for the year 2017 and this means from the time it was launched in May this year to now, there are more than 800 units that have/will hit Indian roads. This also means that if you book a Tiguan now, you will only get delivery of the car in 2018. Interestingly, it has to be noted here that the prices for the Tiguan SUV start at ₹ 27 lakh and go all the way to ₹ 32 lakh. The Volkswagen Tiguan is the first SUV to be built on the popular MQB platform that has been launched in India. As for its design, the Tiguan is not overtly butch and aggressive like the SUVs that are usually preferred by Indian buyers. In fact, its styling cues have been taken from both the Golf and the Passat, two of the most popular VW cars in Europe. Having said that, the Tiguan comes with a wide stance and there are prominent character lines that accentuate its SUV silhouette. 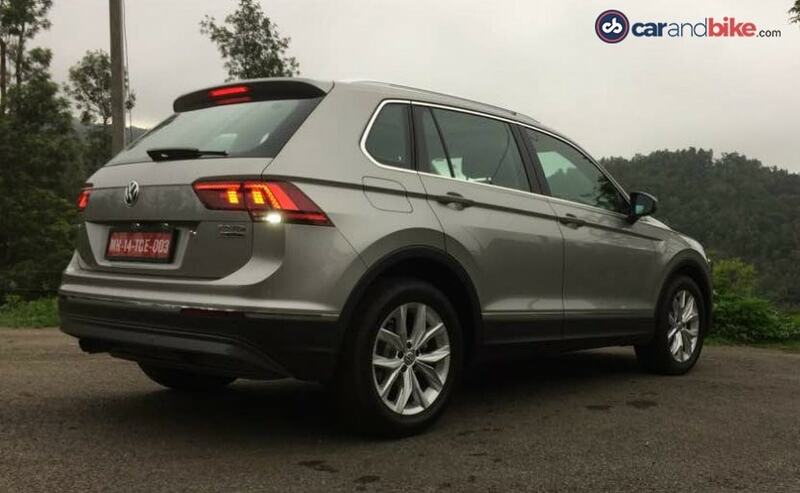 The second-generation Volkswagen Tiguan is also 60 mm longer and 30 mm wider and sits 33 mm lower than its predecessor, which makes it ideal for long-distance highway cruising rather than outright off-roading. But if you do want to take the Tiguan for some off-roading then Volkswagen has equipped it with its 4Motion all-wheel-drive (AWD) system, which comes as standard on both the variants. Despite being a five-seater SUV, the new Volkswagen Tiguan competes in the full-size SUV space, rivalling the likes of the Toyota Fortuner, Ford Endeavour, Isuzu MU-X and the recently launched Skoda Kodiaq. Under the hood, the all-new Volkswagen Tiguan will only be offered with the diesel powertrain - a 2-litre TDI engine that is capable of churning 141 bhp and developing a peak torque of 340 Nm. The turbocharged, four-cylinder oil burner comes mated to the company's tried and tested 7-speed DSG automatic transmission and we know that it's a fun car to drive and our review tells all.